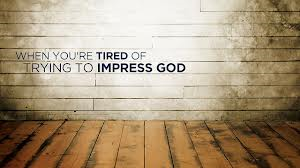 Trying to impress God? Forget about it!! 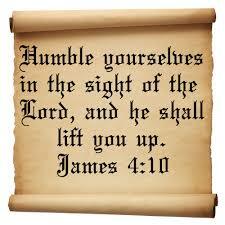 ….humble yourself … you’ll be blessed. 18 “Which ones?” he inquired. 22 When the young man heard this, he went away sad, because he had great wealth. In Verse 20 it says: All these I have kept,” the young man said to Jesus…..”What do I lack? Really? He said he was keeping the commandments…all of them! Was he trying to impress Jesus with that foolishness? Didn’t he realize who He was talking to? The King of Kings and the Lord of Lords!!! The thing He should have done was to fall on his knees and beg Jesus for mercy for His evil soul!!!!!!! Do you know there is NOTHING that we can do to impress God at all? When I first became a committed Christian…I tried hard to impress God. Look God… I’m in church today. Look God… I’m helping people. Oh God look…I’m feeding the poor. God I’m doing lots of good things for you! God…aren’t you proud of me? Thank God for the Holy Spirit who has broken this thing down to me over the years? His instruction and teachings have been life changing for me. I’ve also had plenty of good godly trials and testing’s that have straightened me right up over time. Peter tried to impress in Jesus by using his little security guard skills to protect Him. What was he thinking? Really Peter? Were you really going to impress folks all by yourself and defend Jesus against a gang of men who came to capture Him. It wasn’t impressive at all…it was…foolish! DUH!! You know… I was going to say…men! A woman wouldn’t have done that…we would have tried to talk these men out of it LOL! But I’ll step away from that one! What does move God is our obedience, our forgiveness and our love for one another. The most powerful thing we can ever do to touch Gods heart is……drum roll here….is to believe in His Son Jesus Christ. God is also moved by our worship of Him. So… God can have reactions to things we do…but I believe He draws a blank if we try to impress Him…and I think He would say something like…speak to the hand… I’m not impressed!… kind of thing. Well really …that’s what I would say not God. God would just tell the Holy Spirit to correct us and we would probably get a trial to bring the point home. I can tell you from my experience….IT IS ALWAYS BEST TO BE VERY HUMBLE IN DEALING WITH THE LORD! This will serve you very well in your walk with God! Now here is a very spiritual statement…. We are not all that and a bag of chips because we’re God’s child!!! Yes we are heirs to the throne but we must know our place! I would do anything for my children…but if they thought they were all that with me….that mothering would come out in me! I have personally seen God bring men down who tried to impress Him…..and I want to add that He does this out of love because the results are life saving and life changing….for our present and for our future with Him. 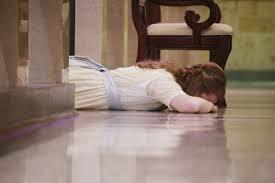 I personally have learned to put my face into the floor (humble myself) in my walk with God. (Learn to be prostrate in your spirit) There are times I feel the devil encouraging me to stand up….you know the pride thing…look what I’m doing thing….but I feel those thorns and I go…”ouch ouch!” and I get myself back down on that ground in humble adoration and respect for my Lord and Savior. Satan did try to impress God and you see where that got Him and he tries to get us to do that too so that God will be very ticked off with us. He does get the non-Christian to act impressively and say they don’t need God for eternal life and as a result they don’t get into heaven. I’m sharing this information today because I want Gods very very best for you. You don’t have to impress God because Jesus did all the impressing for all of us…… on that cross!!!!!!!!!!!!!!!!!! Get on Your Spiritual Nikes…and Walk with God! Hebrews 11:5 By faith Enoch was taken from this life, so that he did not experience death; he could not be found, because God had taken him away. For before he was taken, he was commended as one who pleased God. I love this true bible story and have done a lot of thinking about why God has this story in the bible. What is God saying to us? The meaning of walked in the Greek (Peripateo) is to make one’s way, progress; to make due use of opportunities, regulate one’s life, conduct one’s self, behave. It’s a verb and is used 212 times in the KJV of the Holy Bible. Walked in this scripture verse is an important word that is still hard to figure out. What in Pete’s name did Enoch do that pleased God so much that He would take him straight up to heaven without dying? I think Enoch had a pure heart….not perfect but pure. 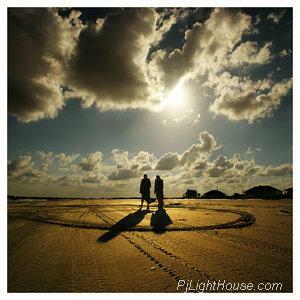 God knew all His motives and saw he had a right attitude in all that he said and did. He was honest and had integrity. This was a trait that was hard to find in his day because people were doing lots of bad things during this time period. I believe that he put God first in everything, cared about others and the most important he worshiped, honored and talked with God deeply and often. This is my little prayer secret….don’t laugh but….. I have tried to do what I thought Enoch did…..but you guessed it…… I wasn’t taken up…I’m still here! I will never stop trying to copy Enoch….but at this point I’ll have to wait until the rapture of the church and get a ride up with everyone else. That’s still really good too!!! I’m ready…got on my good pajamas (wink…for all those who read that blog). You know what I’m going to say here if you are one of my regular blog followers….I love God so….and I’m determined to walk with God. I want to have a great relationship with God…He already has a great one with me, but I need to maintain mine with Him and it’s an ongoing thing for me to always walk that way…..you know it…..distractions. I have the Holy Spirit of God in me and He helps me to walk right. Studying Gods word helps me walk right and I try to talk to God as much as I can so I know I’m on the right path. Does my flesh get in the way?….Yup it does and that makes me mad…..that’s why I’m so grateful for Jesus…the cross and the precious Holy spirit who enables me to get right and keep a stepping….walking with God. I know when I’m walking with God because I feel like dancing right out of my clothes like David did in the bible….come on I said I feel like it…you know I didn’t do it……my knees are really bad and I can’t dance like that anymore…..I can still praise God with my lips…. I can talk to Him in the secret place…and I can live my life to be pleasing to the Lord and I can be obedient to God…..I can walk with God!! Message for today: Before you walk with God you gotta talk with God! Get on your spiritual Nikes, Reeboks, Adidas, whatever you wear…..get moving and……Walk with God!! !